Notes: The Complete Peerage v.XIIpII,p246,note g.
Notes: Archbishop of Canterbury 1193 - 1205. Notes: accompanied Henry II into Ireland, created hereditary Chief Butler of Ireland 1177, was granted Baggotrath, Co.Dublin, and the Stein River lands around what is now Trinity College Dublin. Notes: The Complete Peerage v.XIIpII,p247, note c.
Notes: Chief butler of Ireland. Notes: Called the Noble Earl and by the Irish the Chaste. Constable of Dublin Castle 1349. Chief Governor of Ireland. Notes: Lord Lieutenant of Ireland 1391-3, purchased Kilkenny Castle 1391 from Sir Hugh le Despenser. Notes: The White Earl. Lord-Lieutenant of Ireland 1420-3. Notes: Knight of the Garter. Fifth Earl of Ormonde. Lord-Lieutenant of Ireland 1453. Supported the Lancastrian cause, he spent most of his life in England where Henry VI created him Earl of Wiltshire, a Knight of the Garter and Lord Treasurer. Butler fought for Henry VI against Richard, 3rd duke of York at St Albans on 22 May 1455; escaped from the battle of Northampton on 10 Jul 1460; and fought at Wakefield (Dec 1460); Mortimer's Cross (3 Feb 1461). He was beheaded by the victorious Yorkists at Newcastle-onTyne in 1461, and his head was set upon London Bridge for all to see. As a traitor, his estates, including Ashby De la Zouch Castle, reverted to the Crown. Notes: went on a mission to Portugal in 1472. Edward IV genially regarded the 6th Earl as "the goodliest knight he ever beheld and the first gentleman in Christendom", and added that "if good breeding, nurture and liberal qualities were lost in the world, they might all be found in John, Earl of Ormond". In 1475 the atainder was accordingly annulled by the Irish Parliament. Notes: skirmish with 8th Earl of Kildare 1492. Notes: In 1475 the attainder against the Butler family was annulled by the Irish Parliament. The first English Parliament of Henry VII followed suit, so that the 7th Earl (the youngest of the three brothers), whom the Irish called "The Earl of Wool", was one of the wealthiest of the King's subjects in England. In 1489 he was created Lord Ormond, a barony in the peerage of England, which on his death fell into abeyance between his daughters. He spent the years from 1505 to 1515 in England. While there, the 7th Earl was granted a fine manor house at Beaulieu in Essex by King Henry VII. He entertained Henry VIII there in 1510 and again in 1515. On his death this English property went to his daughter, Margaret, who had married William Boleyn. The son of one her daughters inherited from him no less than 36 manors in England; the son of the other daughter was father of Anne Boleyn. After bequeathing his treasured heirloom of an ancient gold and ivory drinking horn to his namesake and grandson, Thomas Boleyn, the Earl died in 1515 and was buried in an Easter Sepulchre on the north side of the high altar in the chapel of St Thomas Acon, London, built where St Thomas Becket was supposed to have been born. Notes: Through her, the Earldom of Ormonde was granted to the Boleyn family during the brief period of favour of Anne Boleyn. After her fall it returned to the Butler family. Notes: disbarred from title because born before parents got dispensation for marriage, ancestor of Butler of Newchome, Kilkenny (see unproved descent of Yeats). Notes: Also said to have died 2 Jul 1553. Youngest daughter. Notes: Called "The Lame". Viscount Thurles, E. Ossory. Brought up at the Court of Henry VIII who had a high regard for him and created him Viscount Thurles in the lifetime of his father. The King's policy was to equalise as far as possible the influence of the rival houses of Butler and FitzGerald. For 14 years James was Lord High Treasurer of Ireland, and he was given no less than seven religious establishments on the Dissolution of the Monasteries. 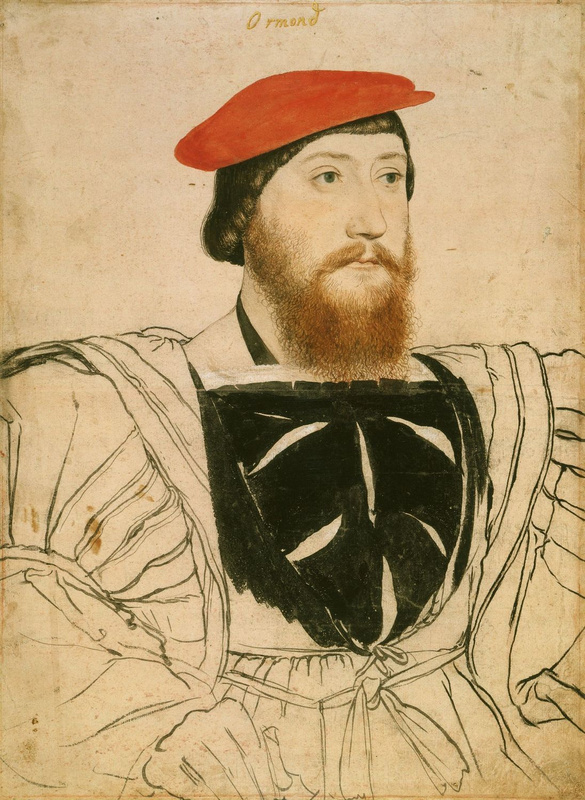 Then, 17 Oct 1546 at the age of 42, he went with his steward, and sixteen of his servants to be entertained to supper at Ely House in Holborn and he and they were mortally poisoned. His steward and 16 of his servants reportedly died of the same. The confusion caused by his Will gave rise to the founding of the Irish Public Record Office. Notes: Not shown by Burke. Notes: had male descendants whose legitimate line faded out with the death of his fourth son (the first and last Viscount Tulleophelim) in 1613. Notes: Succeeded his uncle Black Tom as Earl of Ormond; Member of Parliament for Tipperary. Consistently a devout Catholic, he was known as Walter of the Beads. His heritage brought his a surfeit of sorrow. His claim to the family estates was thwarted by James I. The failure of Henry VIII's policy of a balance of power between the Butlers and Geraldines had been made all too apparent by the Battle of Affane. James sought a different solution. He engineered the marriage of Black Tom's daughter/heiress, Elizabeth Butler, with one of his own Scottish favorites, Richard Preston, made him Earl of Desmond, awarded her, instead of Walter, most of the Ormond estates, deprived Walter of his ancient palatine rights and clapped him into prison for 8 years on his refusal to submit. Neither was Walter without disappointment as a father. His son Thomas, Viscount Thurles, married the dau. 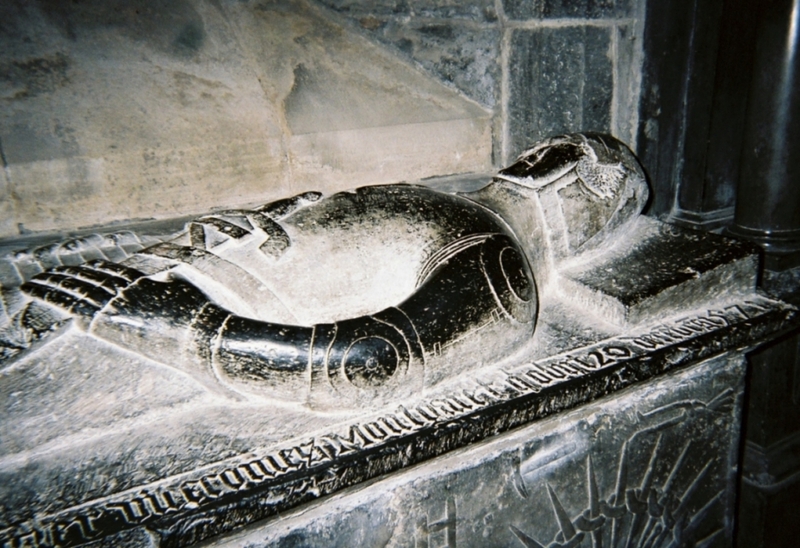 of Sir John Poyntz of Gloucestershire against Walter's wish and then was drowned in the Skerries at the beginning of Walter's long imprisonment in the Fleet. Eventually in 1633, Walter was released, died at Carrick, and was buried in St Canice's. James, a son of the marriage of which he had disapproved, would revive the fortunes of his family. Notes: married against his fathers wishes. Died drowned off the Skerries at the beginning of his father's long imprisonment in the Fleet. Thurles was an important Catholic and, when drowned, was being sent to England on charges of having garrisoned Kilkenny. Notes: Knight of the Garter. When a small boy whipping his top at the feet of Black Tom, the old earl, though blind with age, foretold a great future for him. Then, with his father drowned and his grandfather in prison, James was made a royal ward and, unlike his parents or brothers or sisters, was educated a Protestant. Honours were heaped upon him. At 23, when he succeeded his grandfather Black Tom as Earl, he was made a Councillor for New England; one of the first and by no means the last mention of America in Butler family history. In 1652 he was created Marquess of Ormonde and the patent spelt Ormonde with an "e" which has been retained almost invariably since then. A great Cavalier, he has been likened to Montrose, and Walter Scott wrote in a balad of "Erin's high Ormonde and Scotland's Montrose". He refused the Garter, fought Cromwell, shared the privations of exile with Charles II and then, after the Restoration, was created both an English and Irish Duke, accepted the Garter, held peerages in England, Ireland and Scotland and was Privy Councillor of all three countries. Further, he had the unusual, if not unique, distinction of sitting in the English House of Lords with his three sons, the eldest of whom was also a Knight of the Garter. He was Lord Lieutenant of Ireland and Chancellor of Dublin, as well as Oxford University. He oprocured the incorporation of a College of Physicians in Dublin and founded the Royal Hospital at Kilmainham, inspired by Louis XIV's Invalides in Paris and in turn the inspiration of the Royal Hospital at Chelsea. In family affairs, the Great Duke resolved the difficulties which had beset his grandfather by marrying "the best of wives that ever lived" in the person of Elizabeth Preston, the granddaughter and heir general of Black Tom. No longer were the family's heir-male and heir-general at variance. Married united them in harmonious accord. Of Ormonde's 8 legitimate sons, three survived to be showered with peerages but the other five died in infancy, the youngest at the age of six months when flung by a servant into the arms of death from a carriage as its horses were bolting, near Dublin, by Phoenix Hill. The appointment of the Duke of Ormonde as Lord Lieutenant in 1662 turned out to be the biggest stimulus to expansion and Dlublin burst through its medieval wall. Ormond actively encouraged development of the Trinity College/Grafton Street, an area which had previously been known as 'near Dublin'. Notes: Not sure about her parents. Her father was Baron Dunboyne. Notes: three weeks after Gerald Fitzgerald, E. Desmond, buried his first wife in Jan 1565, he began his courtship of Eleanor Butler. After their marriage, they were almost immediately embroiled in hostilities with the first Countess’s sons by her first marriage to James Butler, E. Ormond. Desmond spent the next seven years in English captivity, which Eleanor voluntarily shared. From Oct 1570 until his release in Mar 1573, he was in the custody of Sir Warham St. Leger and their son James may have been born in St. Leger House, Southwark. When they returned to Ireland, James was left behind in England to ensure his father’s good behavior. More than six years passed before he was allowed to visit Ireland. He resided with his mother at Askeaton, Limerick, but only for a month. Then she was obliged to hand him over to the English authorities. He was kept in Ireland, a prisoner, until his father’s death, and then sent back to England and housed in the Tower of London. An account of the involvement of both the Earl and Countess in Irish rebellions can be found in Richard Berleth’s The Twilight Lords, An Irish Chronicle. It ended with Eleanor, a price on her head, surrendering to the English in 1582. After Desmond’s death, she was resettled near Dublin with her daughters and still resided there, living in poverty, when her son was allowed to return to Ireland in 1600. He died the following year. Eventually, Eleanor was pardoned and pensioned by Queen Elizabeth. She made several visits to London during the latter part of Queen Elizabeth’s reign and the early part of that of King James I. Notes: possible descent of Sir John Butler of Clonamecholon, son of Edmund Butler, Justiciar and Governor of Ireland.